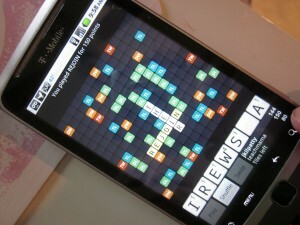 My game-guy Owen has recently fallen hard for a game I’m currently all wrapped up in–Wordfeud. It’s the same deal (I think) as Words With Friends, and it’s an app for my phone. About a dozen times a day, my O-man grabs my phone and checks to see if it’s my turn to play. And if it is my turn, he’ll try to help me find a word that will knock the socks off of my opponent. The only photo I have of the game is my biggest word ever–which we were dancing around the kitchen for: 150 points for ‘rejoin’. Woot! But what I’ve realized is that learning how to build on words, Scrabble-like, is way hard for kids. Maddy and Owen scan my letters and try to make words that I can use, but they don’t actually connect to the words already on the board. Call me crazy, but we have been so busy playing our totally awesome, completely perfect ‘kid’ sneaky learning games and games from Gamewright, LeapFrog, and many other smaller (but equally fab) companies. So in order to try to show my kiddos how the game works–and I emphasize ‘try’–we played real-life Wordfeud on our living room floor with huge letters. And very few rules. Real-Life Wordfeud: While I was away last weekend for Mom 2.0, my own mom brought a bag of ‘goodies’ for me which included a ton of my old mixed tapes from the early 90’s, my old woodshop projects, and a boatload of random party decorations. The party decorations? 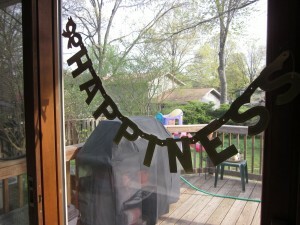 A total jackpot–balloons, streamers, signs, you name it–but there were at least six different hanging signs–from Happy Anniversary to Showers of Happiness. 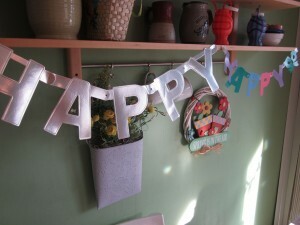 No Happy Birthday, though, so for my husband’s birthday this week, we just used ‘happy’ everywhere we could. After we hung the sings for a few days, we cut the letters apart. We’d use the letters more that way–who knew when we’d need these signs otherwise? Clearly, they’d spent way too long hiding in the basement. They needed a new life–in Wordfeud! We cut the letters apart from the signs. . .
. . . big or small, we didn’t care. 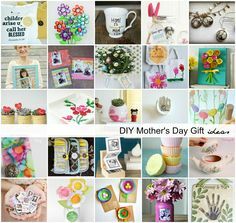 And once we had all of the signs cut apart–and the old, torn pieces were in the trash–we put them in a basket and carried them to the living room floor. I said, Okay, who’s ready for a lesson in ‘Wordfeud’? Owen, of course!, was right there, ready to go. You’ve tried to play with me for weeks now, but I need to teach you how to play so you understand better. 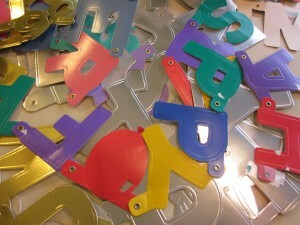 We’re going to use these letters to mamke a real-life Wordfeud board on our floor. 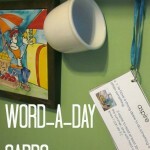 We’ll take turns building words just like we do on Wordfeud. But the tough part is remembering that the words have to fit together like they do in my game. Who wants to start? 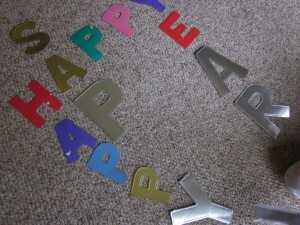 Maddy grabbed the letters and made ‘happy’ on the floor. Then Owen put down an ‘s’ and a ‘p’ for ‘sap’–which got big claps for us–he was building words! Hooray! Our first attempt at word-building! Then I used the ‘y’ and built ‘year’. I said, Look at ‘happy’ and ‘sap’–notice how the ‘A’ and ‘p’ are touching? 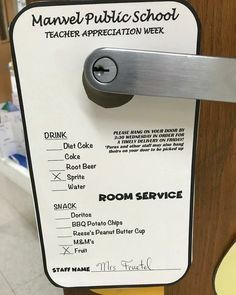 We then talked about how another way to create that same word would be to use the ‘p’ in ‘happy’ so that the ‘a’ and ‘p’ weren’t touching to create the non-word, ‘ap’. Right as we were about to move them, guess who joined our game? Brady. 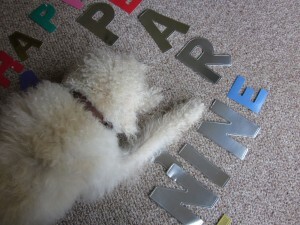 A totally perfect, teachable moment interrupted by our pooch. Maddy had just added ‘nine’ to the mix, when our silly dog got comfy. Guess we should start paying attention to him, huh? Perhaps we have a Martha Speaks on our hands? We joked that maybe instead of eating alphabet letters, our dog just has to sit on them to make him speak. . . We hoped and hoped and hoped, but he never got up, so we couldn’t try it out. 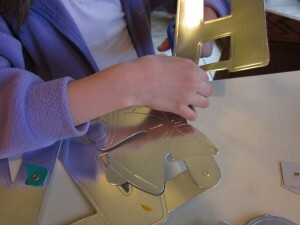 Cora was busy making her own name after we got crafty and made a ‘c’ out of a number 5 that we had in the mix. 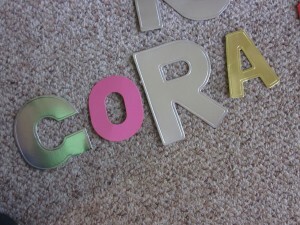 Cora was busy word building, too–her own name! Owen got to work to create the word, Brady, but there were no ‘b’s–remember, no ‘Happy Birthday’ signs?–so he used two ‘D’s-pretty smart if I do say so myself! 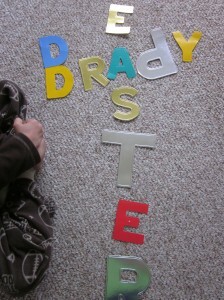 Onto Brady’s name, I created the word, ‘Easter’, but that was way too boring for Maddy and Owen. Owen tried to write ‘stupid’ Brady (really?! why? how? I’m not sure–but I didn’t dwell on it), which he was quickly reprimanded for, and instead, I challenged him to create a stronger, more positive word that began with ‘s’ to describe his pooch. He went instead for something silly, which didn’t surprise me, and I’m not sure he quite understood the concept of ‘describing’ words. We’ll save it for another day. 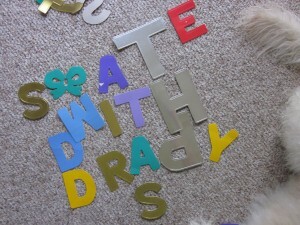 We got ‘skate with Brady’ which Maddy helped him with and which they used a bow for the ‘k’ since we had no ‘k”s. I told him it worked and that one day if he’s really nice to Brady, maybe, just maybe, he’ll be able to skate with his dog–that is, if he even gives you the time of day after he’s made so famous by his speaking. . .
Owen tries to make up with Brady. We played with the words for a while longer, but not much. It was rainy, dreary, and cold, so it was an inside kind of day–perfect for preparing for Easter. 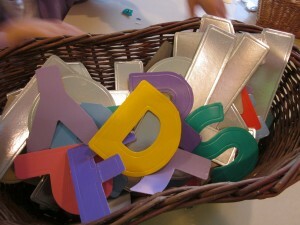 We stored the letters in a basket, ready for next time! 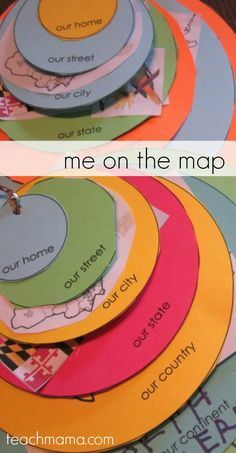 What I realized, through this exercise, is that building words is one thing; it’s a skill that kids can begin to pick up when the time is right and after lots of modeling and practice. But building words upon other words–like in Scrabble or Wordfeud or anything similar–is a whole other ballgame. I’m not going to push it with Owen and Maddy, I’m really not. Perhaps over Easter we’ll bring out Scrabble–the board game–and try our hand at it. Or maybe we’ll just keep these letters in the living room and every so often practice some real-life word building when we have a minute or two. Until then, if my helpers want to jump in on my ‘phone’ games and add their two cents’, I’ll take it. And seriously? 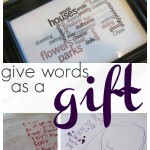 It’s great for my kids to see me playing with words because it will only entice them to keep playing with words, too! Talk about a win-win! I’m a Words with Friends addict and I have my fingers, toes, and everything else crossed that I’ll get approved to do a Donors Choose listing for a pair of iPads. 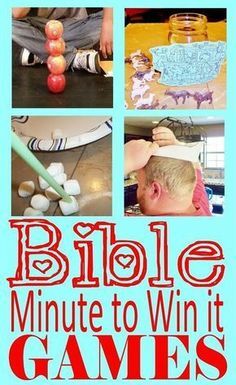 I would love for my kids to be able to play with each other in Words with Friends (among other things). I love your idea for cutting apart the banners too! I recall seeing someone selling a huge bin of them at a yard sale last year so maybe I’ll get lucky and find someone this year since I now have an idea for how to use them. Not sure why it never occurred to me to cut them apart. thanks so much, Morgan!! Hey! 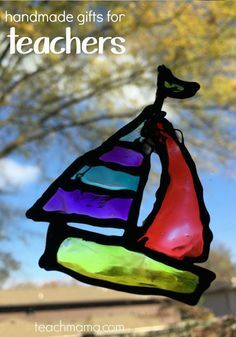 Are you on we teach (www.weteachgroup.com)? I have a friend who said she’d LOVE to help one of our teachers who have a donors choose request–let me know! Oh Brady! That silly dog just wanted to play WordFeud with you! 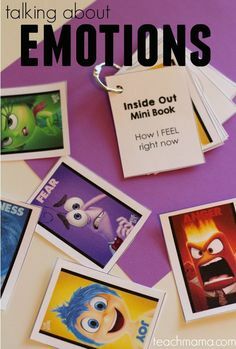 I love that you took your game obsession and turned it into an awesome kids activity!